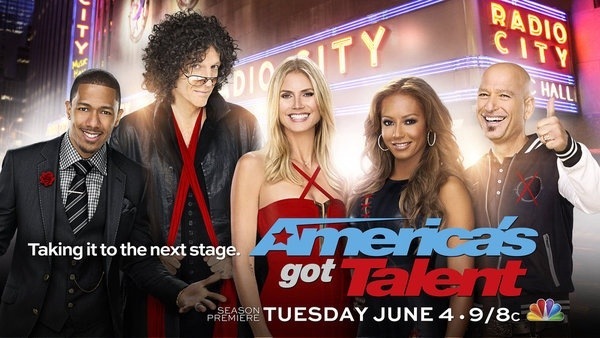 NBC’s America’s Got Talent Returns June 4th. Are You Ready? I have to say that I am properly stoked for America’s Got Talent Season 8. The new line-up of judges looks pretty enticing with the addition of Heidi Klum and Mel B to the panel. I think there will be some wonderful repartee behind that table as all four judges, which also includes retuning judges, Howie Mandel and Howard Stern, are pretty opinionated. And diverse! So anticipate nothing but the very best in entertainment on and off the stage. And, come on, who doesn’t love host Nick Cannon and his zany antics? However, one of the singing acts who auditioned for the Season 8 show is a trio called Forte. A member of this fabulous group, Fernando Varela, is managed by my cousin, Paul Mascioli of Mascioli Entertainment. You can read the background information here. So, pretty exciting from my end! NBC’S BLOCKBUSTER COMPETITION SERIES RETURNS WITH TWO NEW JUDGES AND EXTRAORDINARY TALENT “America’s Got Talent” returns this summer for its eighth season with the hottest performers from across the country ready to compete for the $1 million prize. For the first time ever, the panel will have four judges as chart-topping former Spice Girl Mel B and supermodel TV host Heidi Klum join returning judges Howard Stern and Howie Mandel. Nick Cannon returns as host. The two-hour premiere features explosive auditions from New York City, Los Angeles and San Antonio as the countdown to the live shows at Radio City Music Hall begins. Enjoy the promo video below! And come join the party tonight. The comment doors are now open for business! Good Show last night…I love Howie!!! I think the panel works okay with four of them!!! Stay tuned Vonnie. Stellar acts are on their way! Recorded it and watched it last night, there were a few good acts, namely the 10-year old girl singer, a couple of dance groups, and the country singer. I love watching this show during the summer months. Not sure that they needed Heidi Klum AND Mel B, but hopefully it will go well. It is! Very, very exciting and they will blow you away. I can’t wait…do you know when they are to be on? They are supposed to be seen during the LA auditions which started this past Tuesday. So, hopefully, next week. But the producers may edit it differently. Who knows? Will keep everyone posted. I am a bit upset it conflicts with So You Think You Can Dance, but yes I am ready. I’ll probably watch SYTYCD and record AGT, a lot of filler on AGT to fast forward.